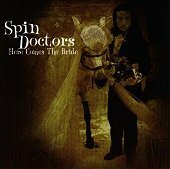 The multi-platinum Spin Doctors are back with another full-length album filled with hippie-pop songs that lack tasty pop hooks, but seems to be a never ending stream of hippie rock grooves. The rhythm section seems to be the only thing holding the band together, which works with the vocals to keep the hippie feel alive. Otherwise, the guitars attempt to bring in a pop sensibility to the music falls flat. It comes through a few times, but not often enough to warrant anything worthwhile. I don't know what it is about this album, but it just didn't strike me. "Siren Dress" may be the exception. It's roots groove is well written and tightly packaged around some light Caribbean beats, giving the song a classy feel to it. You can dance, drink, or relax to this one, and that is why it immediately stands out as a favorite on this album. As for the rest of the tracks, even songs like "Here Comes The Bridge," with its annoying hippie vibe, still have their moments (the organ intro and percussion groove). But, the overall texture of the songs, when put together, just don't hit you in the soul like music should (at least it didn't hit me there). They've had some catchy pop songs in the past, but this album seems to find them losing ground and momentum, or preparing for something bigger and better. Whatever the case may be, they just don't hit the mark on this one. I'll give it a C-.